Barbecue sauce recipes come in many flavors and can be used for basting or only after your barbecue is done. How to YOU like your barbecue sauce? Combine all ingredients in a large pot, squeezing the lemons as you add them. Simmer for 30 minutes, or until the onions are soft. Keep the mop sauce in a pot on top of the smoker so it stays hot. Makes about 6 cups. Just before serving, heat the barbecue sauce, adding fresh meat drippings as you slice your barbecue. Do not store sauce to which meat drippings have been added (food safety reasons). Soak the ancho chiles in hot water for 30 minutes or until soft. In a large, heavy saucepan, heat the oil over medium heat and add the onion and garlic. Sauté for 3 minutes, or until they begin to wilt. Add the ketchup and anchos and sauté for 4 minutes. Add all of the remaining ingredients and simmer gently for 30 to 40 minutes, stirring frequently. Note: This is a thick barbeque sauce - you may want to add water to thin it. Remove the mixture from the heat and allow to cool. Place in a blender or food processor and purée. Serve immediately, or store in the refrigerator in a sealed container for up to 3 weeks. Reheat before serving. This barbecue sauce has been handed down several generations from the cook who served barbecue to Texas Governor Sam Houston in 1860s. Melt butter and add oil, vinegar, lemon juice, and ketchup. Mix thoroughly and heat on medium. Add Worcestershire sauce, chili powder, parsley flakes, and pepper. Bring to a boil and reduce to simmer. Keep sauce hot and use to mop meat during entire cooking time. * Note: Parsley flakes help keep the sauce on the meat. Place butter and oil in a saucepan and heat until bubbling. Add lemon juice and slices, onions, and garlic; cook approx. 20 minutes or until onions are soft. Add salt, pepper, cumin and stir thoroughly. Add all other ingredients except water and cilantro and cook for 1 hour. Add water and cilantro and cook at a slow boil for another 1 hour. In a small saucepan, combine the vinegar, margarine or butter, mustard, salt, and pepper. If desired, add the molasses and/or red pepper sauce. Bring to a boil over medium heat. Reduce heat to very low and simmer about 10 minutes. Makes about 3 cups. Combine all the ingredients in a small saucepan. Cook and stir over low heat until the sugar melts and the ingredients are blended. Lower the heat and simmer about 10 minutes. Makes about 3-1/2 cups. Want to learn more cooking techniques and Mexican & barbecue recipes - delivered monthly to your inbox? 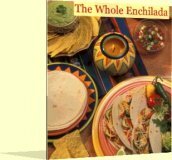 My free E-zine, The Whole Enchilada, is more than just Mexican food recipes. Learn time-saving tips & techniques for cooking all kinds of food, including barbecue and seafood. Lots of delicious recipes, too.